Started pullets are for people who don't have the time, equipment or ability to care for chicks, or who are just too anxious for some fresh backyard eggs to start with chicks. Another wonderful benefit is that our juveniles are sexed twice, once at hatch and again at 6 weeks, which reduces your chance of ending up with roosters! Our six-week started pullets are floor-raised and socialized with humans, vaccinated for Marek's disease, and their beaks are intact--we never trim. This ancient breed has a striking appearance. They hold their tails upright--nearly vertical--and have especially long, graceful necks. They are good layers of small, cream or tinted eggs. The Fayoumi has its origin in the Nile Valley. They are relatively new to the US, and still quite rare here. 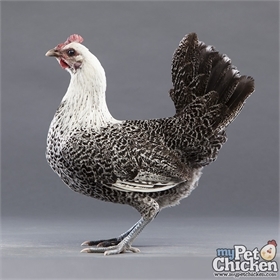 Despite the fact that their eggs are small, they have great homesteading potential for a number of reasons: They are one of the most early maturing of chicken breeds; hens can begin laying eggs as early as 4-1/2 or 5 months! Fayoumis are also naturally resistant to Marek's Disease and to many other illnesses. While they don't produce eggs in great numbers, they eat so little and forage so well, they are inexpensive to keep. Keep in mind that this is not a good breed for a small backyard. They are normally fairly nervous in temperament, and can be feather pickers if they don't have enough room to roam. They can be territorial about their favorite nesting spots, and roosters are noisy. They are also fliers, and can clear most fences. With plenty of room, however, they can be a wonderful choice for a homestead or small farm, since they are good foragers, economical eaters, independent, tough, aware of their surroundings and good at avoiding predators. Limited quantities available, so reserve your birds now! 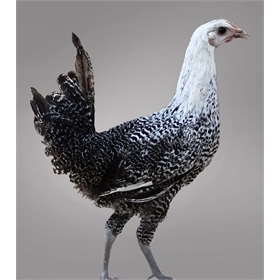 These pullets will be shipped at approximately 6 weeks of age.